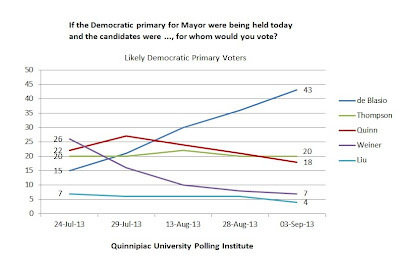 Sept. 3, 2013–At 43 percent and rising, de Blasio may win the Democratic nomination outright, with no runoff. Thompson and Quinn are competing for the runoff spot–if there is a runoff. Thompson is flat at 20 percent; he did not pick up any votes from the falling stars. The memory is still fresh of his close finish behind Bloomberg in Bloomberg's third election to the mayoralty. That is the closest Thompson has come to being Mayor. 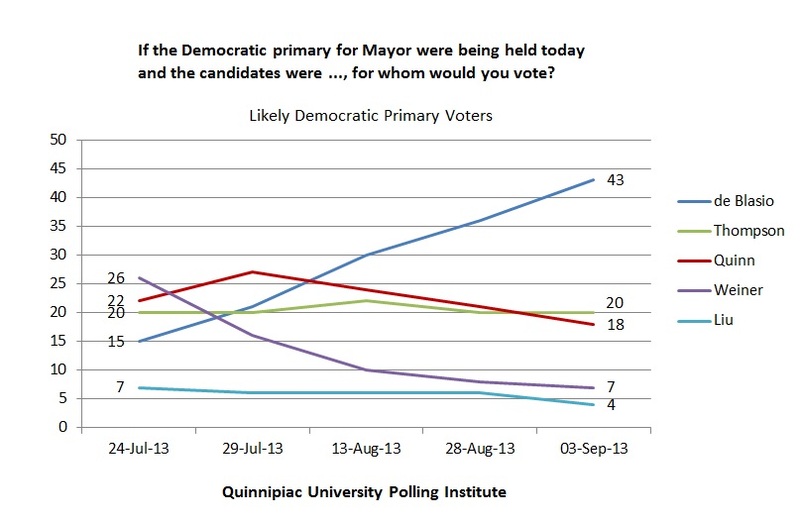 Quinn fell below Thompson for the first time since the polling started in July. Wiener and Liu are competing for the bottom spot, with 7 and 4 percent. Wiener's role in the election may have been to start off tall he surprises by coming in first at the beginning. 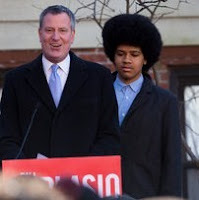 The Quinnipiac Poll cites a campaign ad featuring de Blasio's charming son Dante with a big Afro as helping pump up de Blasio's popularity. De Blasio not only leads Speaker Christine Quinn among women, he also leads former Comptroller Bill Thompson among black voters. Thompson over Quinn, 59-33 percent. With seven days left, only 24 percent of likely Democratic primary voters now say there is a good chance they will change their mind. The Thompson voters (61 percent, i.e., 12 percent of all those polled) and de Blasio voters (59 percent) are more loyal than Quinn supporters (56 percent). De Blasio oriented his campaign for the Democratic nomination around the theme of income inequality–a good issue for the likely Democratic voters in New York, who tend to favor strongly progressive positions.